With a host of landing page builders available these days, it’s easy to think the design process is taken care of. But even with the best landing page builder on your side, you have to make dozens of design choices that will determine the performance of your pages. It doesn’t matter whether you create your own landing pages from scratch or start with templates. You’re still susceptible to the same design mistakes I see all over the web – and here are seven of the most common to avoid. By far the most common mistake I see in landing page design is simply not having enough of them. Every service you offer should have its own dedicated landing page and every major product you sell should have one of its own, too. The same thing goes for every sale of promotion you hold. Better yet, create multiple landing pages for each product/service, targeting a different audience or selling point. A small business is going to have different requirements from accounting services compared to a larger enterprise, for example. Likewise, some gaming fans are going to resonate with titles and genres that others won’t. Rather than promoting a console with generic messaging, you might have better luck by targeting specific gamer interests. The problem with not having enough landing pages is your messages will be too vague to pinpoint specific audience interests, which is crucial to maximising conversions. As mentioned in the previous point, not having enough landing pages tends to result in vague messages – and this is a serious problem. Great landing page design starts with defining a list of target audiences and creating messages tailored to each of their specific needs. Let’s say you’re selling enterprise software, for example. You can identify two key audiences for almost every business type: the business owner themselves and high-level staff with purchasing authority. The business owner is more likely to be interested in how much money your product can save them while staff might be more convinced by how much time your product can save. In terms of visual design, the first mistake you’ll probably fall into is a cluttered layout. Don’t try to be innovative with the fundamentals; stick to a simple layout that helps users navigate through your message and see the most important elements on your page. There’s no one layout that works for every scenario but the single-column layout is a solid choice for just about every occasion. It reduces the workload on user vision, presents one key piece of information at a time and pretty much optimises itself for mobile. Above all, it’s hard to clutter up a single column layout. This one is painfully common, too. There are parts of your landing page that should grab user attention as soon as they see them and others that shouldn’t. Do you really want that pop-up distracting attention away from your call-to-action or an explainer video that interrupts the user journey through your page? I’m not saying you shouldn’t use popups or explainer videos, but you don’t want to use them at the expense of more important elements. Also be mindful of how you style design elements. Dodgy font choices, a touch of bold colour in the wrong place or a distracting image can take attention away from parts of your page that should stand out the most. Distracting design elements: As mentioned in the previous point, avoid other design elements taking user attention away from your CTAs. Poor CTA placement: Putting your CTAs too far down the page means people might never see them. While placing them too far away from the core benefits of your message can reduce their incentive to take action, whether users see them or not. Lack of incentive: A CTA that compels people to take action will always stand out ahead one that’s less inspiring. This depends on the message surrounding your call-to-action as much as the text in your CTA button. Lack of contrast: The easiest way to make your CTA visually stand out on the page is to use high contrast. Bold colours are the obvious choice but you can also use size, shape and style are among the other types of contrast you can use to make your CTAs stand out. 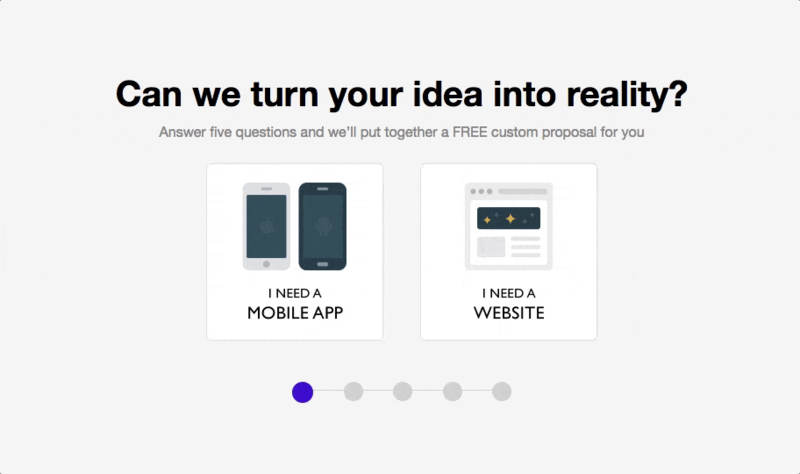 Creating CTAs that inspire action is essential to every landing page you design. Before they can do this, though, they need to capture user attention and point them in the direction of taking the desired action. Landing page forms often get overlooked when it comes to optimising for conversions. This is pretty crazy when your forms are the final hurdle users have to jump before converting – which is the whole point of landing page design. Google Analytics isn’t a bad tool for optimising forms but you might get better results from a dedicated form optimisation tool. Leadformly comes with a selection of already-optimised forms that you can embed directly onto your landing pages. You also get analytics reports for specific form fields to see where users are running into problems and customisation options to make design improvement without writing any code. There’s been a lot of talk about A/B testing over the last five years or so. In principle, it’s a great idea, but the notion that you have to test every minute detail on your landing pages is ridiculous. Forget about boosting conversions by 600% from changing a button colour and anyone who makes claims these kind of results are realistic. People don’t buy from you because of the colour of your CTA buttons. They buy from you because your products are worth buying, your web copy is compelling and you effectively nurture them across the buying process. I’m not saying button colour isn’t something to think about, but don’t waste time testing minute details for months on end. Focus on the design elements that actually have an impact on buying decisions. In today’s article, we’ve covered some landing page design mistakes you really want to avoid. But if you want some examples of what you should be doing with your landing pages, check out our 15 Landing Page Form Best Practices & Examples and 101 Landing Page Optimisation Tips articles for a whole bunch of pointers.